– If you are brave and tolerate the spicy food. – This is your Recipe! Since these shrimps are so spicy... you will feel that fire comes out of you like a devil . That is why the name “devil" was given to this recipe. The dish is very spicy because it is prepared with the combination of 3 chilies: the guajillo pepper, the arbol pepper and the chipotle pepper. However not everything is hotness in this dish. At the moment of preparing the shrimps they are also seasoned with other ingredients that give a very good flavor to the shrimps. This dish can be served as appetizer and it is excellent to whet the appetite due to its hotness. It can also be served as main course but don’t forget to accompany it with red rice , white rice , refried beans , mixed salad or with the garnish that you like the most. This will help to disguise the shrimps’ hotness and you will be able to tolerate them in a better way. 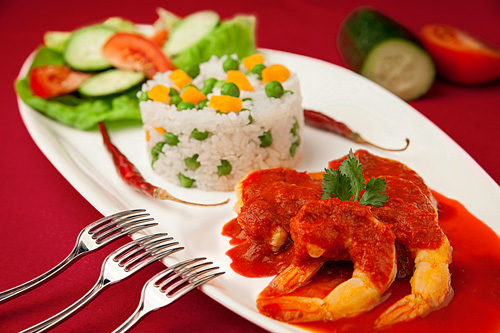 *The devil shrimps are typical from Guerrero’s gastronomy. A land of fusion of cuisines where the flavors and the aromas abound. To prepare the devil shrimps there are many steps to follow. Follow them carefully so the dish will be a success. In this recipe you have the freedom of adjusting the dish hotness with the quantity of arbol peppers that you use. The chipotle pepper in adobo, that is also used in the preparation, can be bought canned or prepare it yourself. The total preparation time is of 15 minutes . The recipe is for 4 brave persons. Discard the seeds and the veins of 6 guajillo peppers. Upon completion put them in a saucepan. If you don’t want such a devil salsa also discard the seeds of the arbol peppers. Bring the saucepan water to a boil over high heat and leave the chilies cooking in the boiling water for about 4 minutes, until they soften. Transfer from the saucepan to a blender, with a kitchen spoon, the chilies that were cooked. Remove the head of the shrimps that were peeled and the vein that is located in the upper back. Sprinkle over the shrimps with the ones you worked, 1/2 tablespoon of salt and pepper to taste; then set aside. Incorporate in the frying pan the shrimps with the ones you worked and fry them for about 3 minutes, until they are lightly cooked; stir regularly. Strain over the frying pan the devil salsa that was prepared. Mix all the frying pan ingredients and fry the devil shrimps for about 2 minutes, until they are moderately cooked and the salsa has thickened; stir regularly. Careful! Don’t fry the shrimps for a long time because their texture becomes rubbery and they lose flavor. Tip: Since you ate a very spicy dish you will need a refreshing Mexican drink. Variations: In Mexico the shrimps can also be prepared with garlic , in a ceviche , with vinaigrette , etc. Did you like the Devil Shrimps? “The Guajillo Peppers Don Enrique" are quality chilies for its incredible aroma, its slightly spicy tasty and for its beautiful red color. Don’t worry if you cannot find the arbol peppers. Here they are ready to be used in your next salsa! With the “Chipotle Peppers La Costena" the chilies list that you need for the recipe is completed. The beauty of these chilies is that they are immersed in an adobo salsa that takes the flavor to another dimension.